The IEA, in its latest Oil Market Report, forecasts global oil demand growth for 2019 at 1.4%, .1% higher than 2018. MonteQuest wrote: No, it is not. What we are talking about is how much of the primary energy pie has renewables captured? Every year since 2004, people have posted on many forums that renewables are soon to overtake fossil fuels and capture a huge market share of our overall energy pie, yet they never do. In fact, the last time I weighed-in on this back in 2016, I think it was, you posted all manner of growth projections, cost reductions, etc--just like you are doing now. Many of them came true, but they hardly changed a thing. Solar PV, wind and geothermal comprised 1.4% of our energy back in 2016. 1.6% in 2017, and now 1.7% in 2018. They only met 25% of new demand in 2018. You can post all manner of growth projections, cost reductions, etc, but as long as the demand for new energy exceeds the new installed capacity of renewables, it doesn't matter one wit. As long as the hole in the bucket is larger than what you can pour into it, it will never be filled. MonteQuest wrote: So, I ask again, what''s your prediction for the REN21 Renewables 2019 Global Status Report? Wind, solar, and geothermal will rise from 1.7% of the energy pie to what percentage? Do you see renewables growing their installed capacity 300% in 2019 to even meet new energy demand? The report comes out later this year. The report comes out this year(2019). However the data is from last year(2018). And we already know renewable deployments slowed in 2018 from other sources. However we also know that renewable deployments increased in 2019, which won't appear until 2019 data is reported by Ren21(ie: 2020 Global Status Report). Renewables share of the electricity pie seems to be growing around 1% per year. Looks to me like there was an increase in renewable total energy growth in 2018(0.2%), compared to 2017(0.1%) despite the fact the capacity deployments were down that year. Although it's possible ren21 and the IEA might end up with slightly different values. Had California and Germany invested $680 billion into new nuclear power plants instead of renewables like solar and wind farms, the two would already be generating 100% or more of their electricity from clean (low-emissions) energy sources, according to a new analysis by Environmental Progress. Had Germany spent $580 billion on nuclear instead of renewables, and the fossil plant upgrades and grid expansions they require, it would have had enough energy to both replace all fossil fuels and biomass in its electricity sector and replace all of the petroleum it uses for cars and light trucks. Had California spent an estimated $100 billion on nuclear instead of on wind and solar, it would have had enough energy to replace all fossil fuels in its in-state electricity mix. As a result of their renewables-only policies, California and Germany are climate laggards compared to nuclear-heavy places like France, whose electricity is 12 times less carbon intensive than Germany’s, and 4 times less carbon intensive than California’s. Thanks to its deployment of nuclear power, the Canadian province of Ontario’s electricity is nearly 90% cleaner than California’s, according to a recent analysis by Scott Luft, an energy analyst who tracks decarbonization and the power sector. California’s political establishment pushed hard to close San Onofre nuclear plant in 2013 — triggering an on-going federal criminal investigation — and later to close Diablo Canyon nuclear plant, which generates 15% of all in-state clean electricity, by 2025. Carbon emissions rose 3.2% in California between 2011 and 2015, even as they declined 3.7% in the average over the remaining 49 states. Ontario’s electricity is nearly 90% cleaner than California’s. In 2016, emissions from electricity produced within California decreased by 19%, but 2/3 of that decline came from increased production from the state’s hydro-electric dams, due to it being a rainier year, and thus had nothing to do with the state’s energy policies, while just 1/3 of the decline came from increased solar and wind. Other nuclear plants were forced to close prematurely, including Rancho Seco and San Onofre Nuclear Generating Station, while Diablo Canyon is being forced to close by California's Renewable Portfolio Standard, which excludes nuclear. Had those plants been constructed and stayed open, 73% of power produced in California would be from clean (very low-carbon) energy sources as opposed to just 34%. Of that clean power, 48% would have been from nuclear rather than 9%. California's nuclear abandonments locked in fossil fuels. Again, absolutely ignores the debacle (big mess) that those, especially in the US and Europe, are in trying to build new nuclear, despite massive government guaranteed loans and all that. Freakin' propaganda. Meanwhile, alternatives keep moving forward globally, apparently reaching economic parity with fossil fuels, even in areas that don't provide huge incentives. Fortunately for the human species the governments of Asia and Eastern Europe are not nearly as foolish about this particular topic as Western Europe and North America. Speaking of propaganda, cyclic random renewable power is still the most expensive way we have to generate power. Particularly if you extract the massive "investment" of government subsidies. So we're STILL burning more coal in the US each year, despite all the hoopla about coal being bad, and we're going to stop burning so much of that due to it being "dangerously dirty", etc. Without coupling renewable with conservation there will be no net emmission improvement, it’s just more cheap calories. But it ISN'T cheap calories! In another thread you mentioned how money spent on fighting in the Middle East since WW II concluded is one primary cause of 911, or at least that is what I thought you said. In part that is true, but there is another extremely large factor you kind of glossed over. Until the 1920's when Iraq, Iran and Kuwait were all selling petroleum on the world market later followed by Saudi Arabia and others the next decade the region was poor and unattractive. Oil resources brought huge wealth flows into the region, but as part of that they also brought huge numbers of Europeans and Americans and even Soviets who had radically different ideas about how people in the middle east should exist culturally. Mix cultural difference with the competition for wealth and you get instant conflict. Then add in governments willing to use their influence to have the governments in the middle east engage in wars one against another for international advantage (the Iran-Iraq war comes to mind). Naturally the people whose lives are being mangled and changed by western money and culture are going to resent the daylights out of those factors. Then whether you believe Israel is a rightful nation of the Holy Land or not you had western powers, struck with guilt over the slaughter of Jewish civilians in 1942-45 by Germany, force the new nation into existence in 1948. That only adds to the rage and intense loathing of the region where common people see that the international western community treat them purely as pawns in the 'great game' rather than as self determining people with goals and beliefs that are as valid as anyone else's. Now we come to the topic of this thread. In terms of spending for or on the middle east all of the westernized nations, including Japan and South Korea, send huge sums of money there for the resources they can buy on the international market. In 1988 the largest single consumer of Petroleum Products on this planet was the government of the USA mostly for military vehicle use. The second largest and close behind was the USSR government for the exact same reason. We have known since the 1930's viable and more or less efficient ways to manufacture liquid fuel substitutes in the form of synthetic fuel made from lignite coal (primarily). It is moderately more expensive in terms of unit cost to manufacture liquid fuel substitutes if you do a simple side by side cost ignoring externalizations. However any sound analysis would preform a whole system survey showing that if the USA had adopted on a mass scale the conversion of abundant lignite into synthetic fuel for the military we could have eliminated most if not all spending on the middle east. Instead we hid the huge financial and social costs of importing oil from the middle east, which altered the cost benefit equation way out of reality, and we have sunk enormous funds into the Middle East as a result. Here are a couple of other factors to consider, if the USA were not importing petroleum from the middle east at all from say 1975 onward the world demand would drop significantly, just as we saw from 2008. That would leave room for other nations who wanted to import middle eastern oil to both purchase and take responsibility for defending those oil fields allowing the USA to effectively withdraw from the Persian Gulf. That would have created a big cushion in the USA federal budget from 1975-1989. While in all likelihood the politicians would have done what they always do and wasted it it could have been used as you desire to subsidize intermittent 'renewable' wind and solar. Or it could have been used to build a few more large scale hydro-electricity dams. Or it could have been used in researching passive safe nuclear power plants in 1975 well before Three Mile Island, Chernobyl and Fukushima. Most likely it would have been wasted on vote buying for congressional members of both houses, but if we dream we should let ourselves DREAM, right? Outcast_Searcher wrote: So we're STILL burning more coal in the US each year, despite all the hoopla about coal being bad, and we're going to stop burning so much of that due to it being "dangerously dirty", etc. As it says in my quote, those are global numbers. In the US, coal is decreasing. Here's the numbers for the US for 2009 and 2018. Fossil fuel total generation in the US has shrunk this past decade. 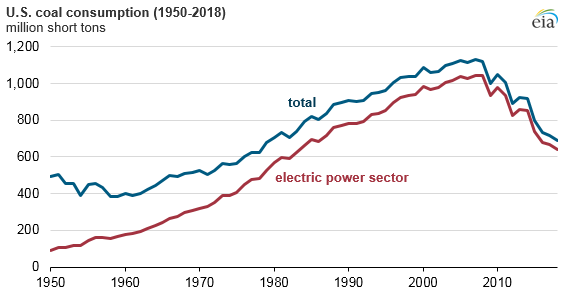 The increase in natural gas generation was not enough to make up for the shortfall in coal and oil generation(Keep in mind this is only looking at the increased natural gas used for electricity. Natural gas use also increased for heating, petrochemicals, etc.). Total generation increased. The shortfall was made up by increased generation from renewables. Nuclear generation was relatively flat. Renewables' share of the electricity mix has increased considerably this past decade in the US. But it is still lower than global numbers. However if you add in nuclear, the US share of Non fossil fuel power is larger than the global average. Read your above post to my Wife. We agree that was an excellent and informative analysis. Thank you.